Krishna is the most endearing and ennobling character in Indian mythology. He is at once the common cowherd engaging the milkmaids in playful banter and the supreme intellectual engaged in the expostion of the Gita philosophy. Krishna has a particular appeal for children because he is one of them as no other divine is. Krishna the boy is mischievous; he is naughty. He has irrepressible energy for innumerable escapades. He is on prig; he is no puritan. He has divine powers, but he humanises them. This powerful human element is the secret of Krishna's universal popularity. He is secular even as he is sacred, and so he remained throughout his life. That is why Krishna becomes a living presence to all children who have listened to the stories about him. Playful cowherd, supreme intellectual, the ultimate romantic- Krishna, one of the most loved gods of Indian mythology has a myriad forms with which he reaches out to his devotees. Here are five enthralling stories that tell of this invincible deity. 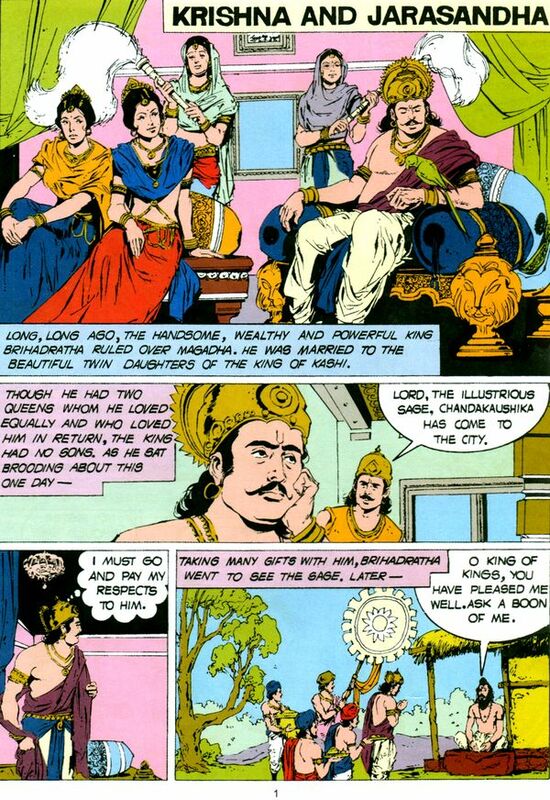 Stories of him as a child, mishievous, bubbling with enthusiasm and plunging from one escapade into another, as a lover who woos and elopes with the beautiful Princess Rukmini, as a man defending his honour after being wrongly accused of stealing the Syamantaka gem, as a friend of the Pandavas who tells them how to defeat the powerful Emperor Jarasandha, and as the vanquisher of the demon Narakasura who symbolises all the force of evil. 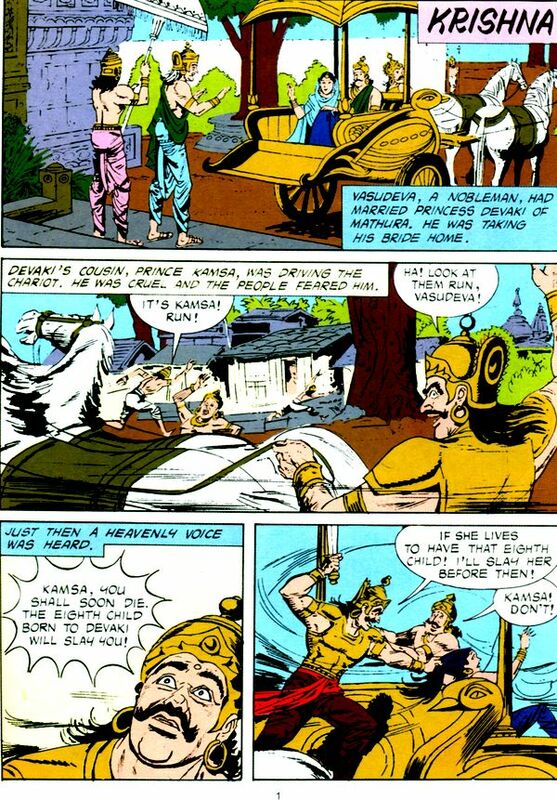 Throwing his aged father into prison, kamsa occupied the throne of Mathura. Commanding a formidable army he thought he was unstoppable. 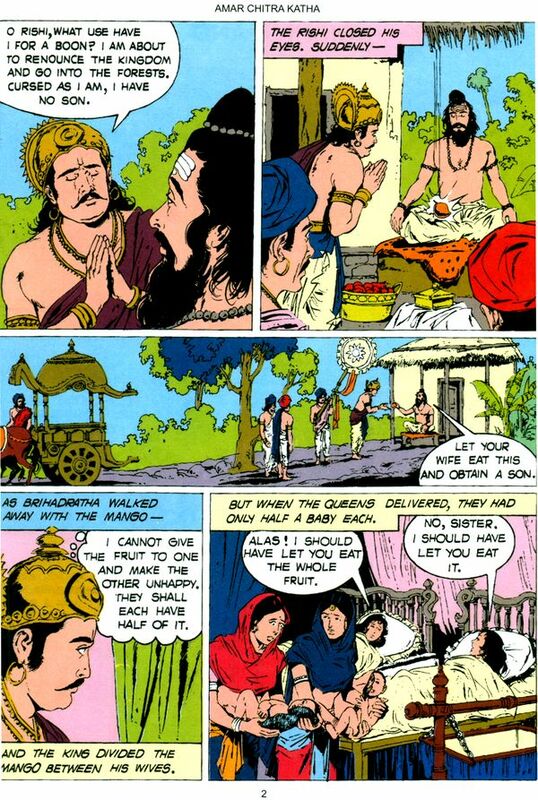 The threat to his power came from an unexpected quarter oe from a cowherd boy who was rumoured to be his cousin Devki's eight child, krishna. 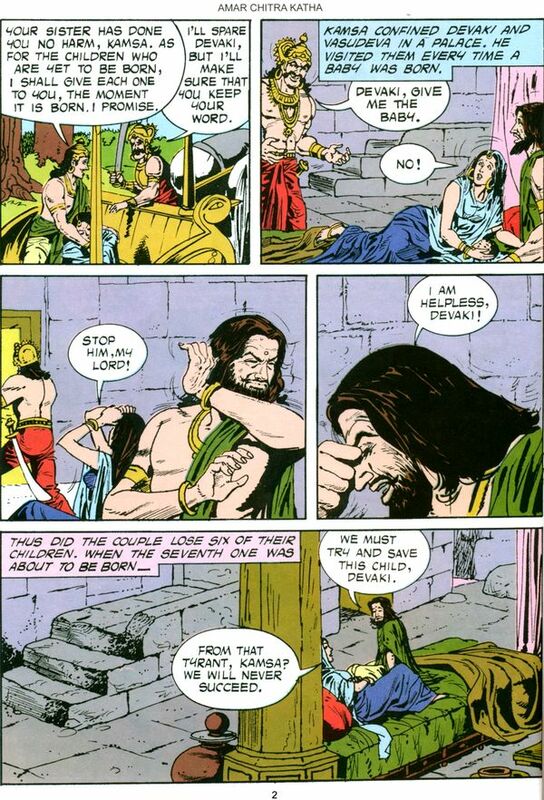 Moreover there was a divine prophecy that kamsa would meet his end at the hands of the eight child of Devaki. The beautiful Princess Rukmini, they said, was the goddess of wealth herself. No wonder kings and emperors wanted her as their wife. Her brother Rukma wanted her to marry Shishupala for political expediency. 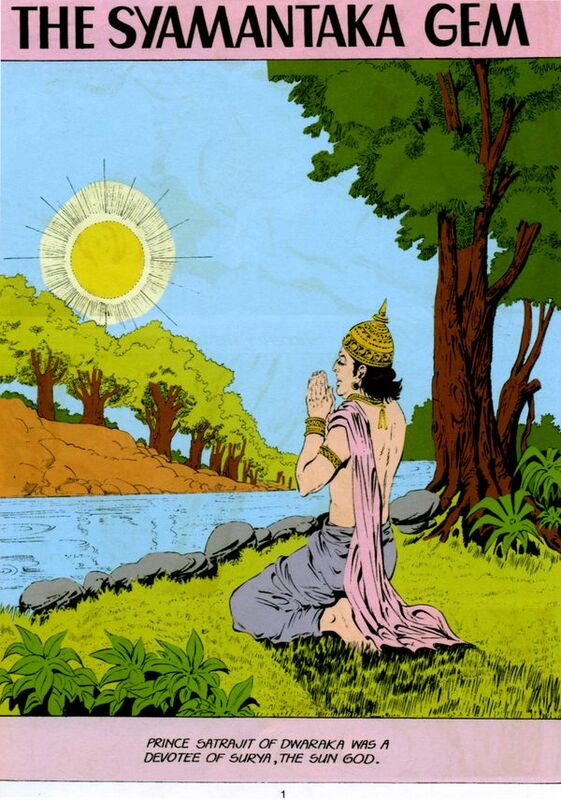 But Rukmini had set her heart on the valiant Krishna, the prince who was Lord Vishnu himself. Now, krishna had to whisk her away from under the noses of his enemies. Would his prowess be equal to his love. And would Rukmini win the happiness for which she had prayed. To the women of Dwarka, Krishna is the most coveted jewel, the husband they yearn for most of the men, the Syamantaka, the sun-god's shining gem, is the most sought-after prize. This is hardly surprising- it is known to regularly bestow a hoard of solid gold on their Prince Satrajit. 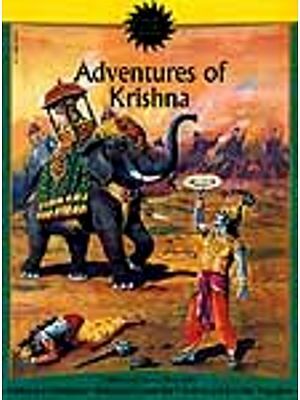 When the gem goes missing, suspicion falls on Krishna. He must prove his innocence, but danger and upheaval threaten at every turn. The Yadava tribe fled to distant Dwaraka to escape the wrath of the mighty Jarasandha, the ruler of Magadha. 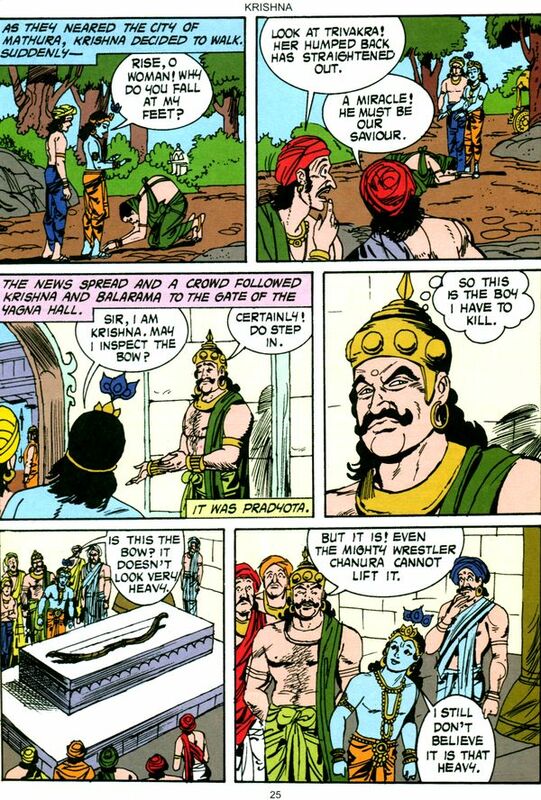 This king, whose very name made the strong quake, had to be subduced if the Pandavas were to establish their supremacy in the area. 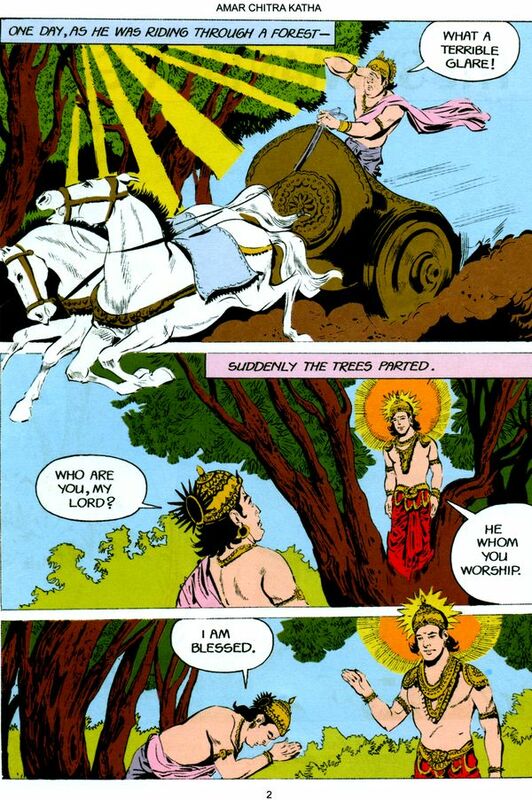 Only their cousin krishna, a Yadava hero, could help them, and this is the tale of his triumph. Indra was at his wit's end - the impertinent demon Narakasura had stolen his mother's earrings! Lord Krishna, always helpful, agreed to confront the enemy. But seated on Garuda, his trusty eagle, and accompanied by the gentle Satyabhama, would Krishna be able to overcome Narakasura's formidable defences. Would his gleaming discus ever find its mark?